May reduce symptoms of arthritis. Stems the growth of cancer cells in in vitro culture. 5-LOXIN® is a new, patented and standardised extract of Boswellia serrata providing 30% acetyl-11-keto-beta boswellic acid (AKBA), one of the most powerful boswellic acids for joint health and inflammatory problems. Standard Boswellia serrata extracts have demonstrated anti-inflammatory efficacy but they generally contain only 2% to 3% AKBA. 5-LOXIN® inhibits inflammation by destroying the action of the enzyme 5-lipoxygenase (5-LOX), which is involved in biosynthesis of the inflammation mediators leucotrienes, as well as by inhibiting the adherence molecules ICAM and VCAM, also involved in inflammation. In the presence of excess arachidonic acid, the body increases production of enzymes such as 5-lipoxygenase (5-LOX) in order to degrade this acid. 5-LOX directly stimulates cancer cell proliferation. In addition, the breakdown products generated by this degradation process, such as leucotriene B4, 5-HETE and hydroxylated fatty acids, cause tissue destruction, chronic inflammation and increased resistance of tumour cells to apoptosis (programmed cell death). One animal study compared the anti-inflammatory effect of 5-LOXIN® to that of ibuprofen. 5-LOXIN® reduced inflammation by 28%; ibuprofen by 35%. Another study comparing the efficacy of 5-LOXIN® to that of the steroidal anti-inflammatory prednisone, showed they had similar effects and that 5-LOXIN® produced a 55% reduction in inflammation. However, ibuprofen and prednisone can be toxic when used to treat a chronic condition, while 5-LOXIN® has no side-effects. Tumour necrosis factor alpha (TNF-alpha) is a dangerous, pro-inflammatory cytokine, levels of which often increase as we age. In a gene-chip study, 5-LOXIN® blocked the expression of many genes that are sensitive to the pathological effects of TNF-alpha. Cancer cells use the enzyme MMP (matrix metalloproteinase) to tear down the natural barriers in the body that would normally contain them. Prostate cancer cells are known to induce production of this enzyme which causes containment structures within the prostate to disappear, thus allowing mutant prostate cells to break through healthy tissue, and to metastasize. 5-LOXIN® has been shown to prevent TNF-alpha-induced expression of MMP. In joint cartilage and tissue, 5-LOXIN® prevents collagen degradation, protecting cartilage and joint fluids from breaking down, by inhibiting production of the MMP enzymes that selectively destroy the peptide bonds and structural proteins. Prostate cancer cells use adherence molecules (VCAM-1 and ICAM-1) to facilitate their proliferation throughout the body. It has been shown that 5-LOXIN® prevents the increase in these adherence molecules which is directly involved in inflammatory processes. Other ingredients : microcrystalline cellulose, silicon dioxide, magnesium stearate. 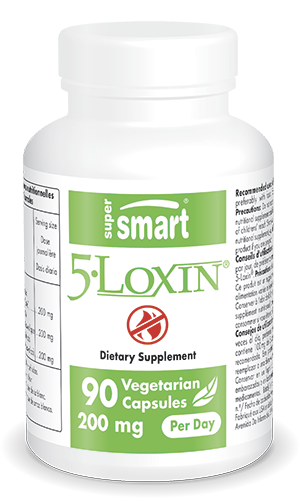 5-Loxin® PL Thomas & Co. Inc.
Each vegetarian capsule contains 100 mg of 5-Loxin®.